WASHINGTON — Sen. Mazie Hirono (D-Hawaii) on Jan. 29 announced hiring two experienced defense and military experts with island ties for her legislative team. Nick Ikeda, a former aide to Sen. Daniel Akaka and Department of Defense expert, and retired U.S. Air Force Col. Walter Kaneakua, a former aide to Sen. Daniel Inouye, will make up Hirono’s defense and military legislative team. 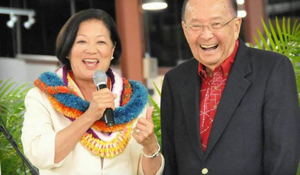 Then-Rep. Mazie Hirono was supported by Sen. Daniel Inouye during her Senate campaign last year. With top military officials warning that the nation will face cuts to armed services in the coming months, these staff members will assist Hirono in making the case for how Hawaii’s strategic location can help the military address the growing national security demands of the Asia-Pacific region. Ikeda, Hirono’s military legislative assistant, has a wealth of knowledge and experience in military and national defense issues. He served Hawaii as military legislative assistant to Akaka, a member of the Senate Committee on Armed Services. A graduate of the U.S. Air Force Academy and a retired Air Force lieutenant colonel, Ikeda has significant Department of Defense experience serving in a wide range of leadership roles within the Air Force, the Missile Defense Agency and the National Reconnaissance Office. Kaneakua, Hirono’s military liaison, has strong relationships with Hawaii’s military and veterans. He was a key Honolulu-based liaison to the armed services in Hawaii as an aide to Inouye. Kaneakua served 27 years of active duty with both the Air Force and Hawaii Air National Guard. He will be a crucial connection between the senator and Hawaii’s military leaders, service members and veterans. Hirono was recently chosen to sit on the Senate Armed Services Committee, which is charged with oversight of the nation’s military, Department of Defense, benefits for military members and other matters pertaining to national security. Hawaii’s defense industry serves as the state’s second largest economic industry, accounting for nearly 10% of total GDP and employing more than 100,000 people. As the Obama Administration pivots its focus to the Asia-Pacific region, Hawaii serves as the headquarters of the critical U.S. Pacific Command.